The Thielman Trail Ride is a very well organized event. This was my first time attending, and I could not have been more pleased with the day. The sound check and registration went quickly and smoothly. There was plenty of parking for everyone, and many people were camping there for the weekend. Families were seen throughout the grounds with some choosing to bring bikes for everyone, and others were divided up with half the family riding, and the other half just enjoying the beautiful day and the camping. I had a chance to meet a number of people during the day on Saturday, and was always greeted with a friendly smile, an honest handshake, and many good stories. Just a quick ride report from this last Sunday in the Chengwatana State Forest. If you haven’t been to this area before it is a small state OHM and ATV trail system, but one of the closest to the Twin Cities area. I had my son in tow riding a DR250. It was his first time on a real trail and he had a great time. 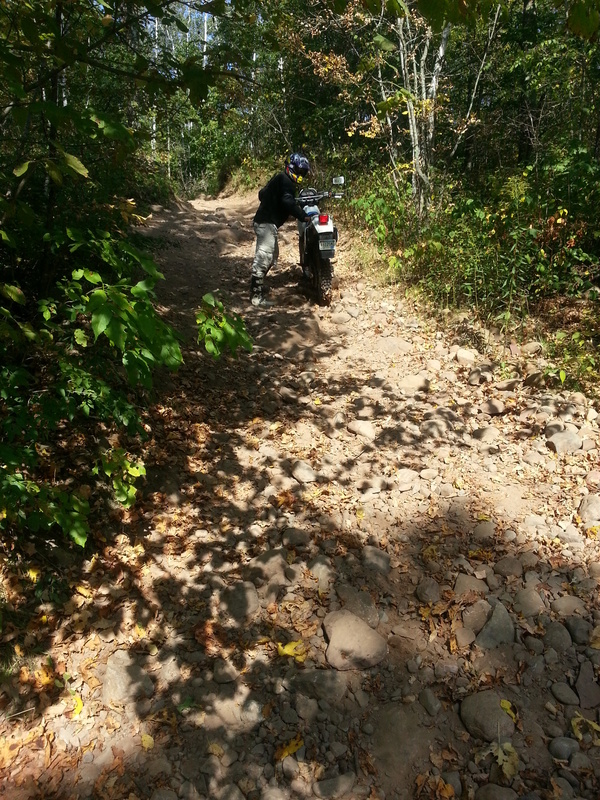 The photo below shows him trying to get up the only hill climb on this trail which can be pretty gnarly. The rocks in the photo are not limited to this hill. Almost the entire trail has good sized rocks and ruts. My advice if you go to this state forest? If you go on the weekends, get there early, like 8 or 9 AM before the ATVs arrive. Many of the trails are twisty single or double track and running into an ATV head-on is no fun. I have no idea why the DNR doesn’t make these trails one-way only. I would also suggest only planning 2-3 hours of riding here as the trails system is very short. I also have no idea why they don’t connect this trail system with the St. Croix forest trail system just a few miles to the North. This would make a much larger and more attractive tourist destination for very little investment. You can always jump on the county highway to get up to St. Croix or Nemadji though, and the Trans-Minnesota Adventure Trail GPX files will guide you on the quickest route. Be sure and visit http://www.MinneADV.info for the latest on organized rides for September and October. New rides were just posted. You are currently browsing the Minnesota Adventure Riders blog archives for September, 2012.